A 3D board game by Denys Fisher, first published in 1971, which was based on the US board game "Which Witch". There were several games released in the UK during the 1970's and 1980's on a very similar theme, such as Scream Inn, Ghost Train and Ghost Castle. 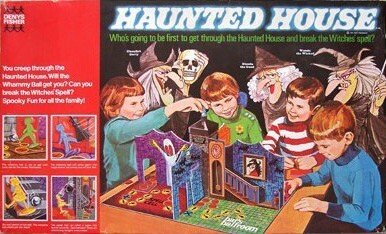 Denys Fisher produced a 2nd edition of this game in 1975 called "New Haunted House". The object of the game is to be the first player to travel through the Haunted House and reach the charmed circle at the top of the stairs, but there are lots of dangers along the way to catch you out, when the "Whammy Ball" is dropped down the chimney.